What is the Lenovo Smart Display? 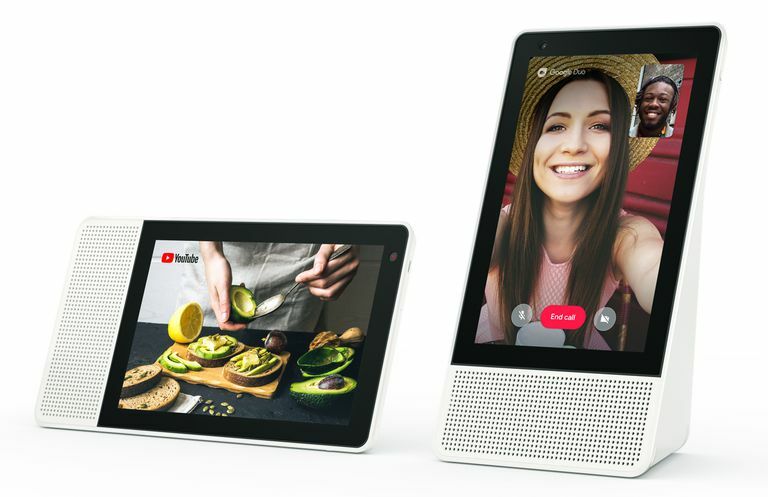 The Lenovo Smart Display is one of a growing number of smart home products, which includes the Google Home Hub and Amazon Echo Show, that combine the features of a smart speaker, including voice control, with a built-in 8 or 10-inch touchscreen providing added interaction capability and control of smart home devices, as well as video calling. Voice responses combined with images/video. Screen displays text of voice commands. The camera can be covered and mics muted. Controls compatible smart home devices. Portrait mode only for video calls. Video calling requires Google Duo app. Speaker on one side, no music listening in stereo. No AV outs to connect to larger screen or external speakers. Can't be paired with Bluetooth speakers or headsets. Listen To Music: You can use the Smart Display to listen to music from Pandora, iHeart Radio, Spotify, and other select music streaming services. Music title browsing can be done using the touchscreen. The screen can also display lyrics and other information when available. Bluetooth is also provided for direct music streaming from smartphones. However, while this feature allows you to listen to a Bluetooth source on the Smart Display, it doesn't allow you to send music from the Smart Display to a Bluetooth headset or speakers. In addition to music, you can also listen to Podcasts provided through the Google Podcast Service as well as audiobooks from Google Play Books or Free Book Reader. The Smart Display will show a picture of the book and any other provided information. However, book text will not be displayed, you can only listen to the audio reading. If podcast or book listening is interrupted, or you switch listening from your smartphone to the smart display, it will continue where you left off. Netflix and Amazon Video are not included. The Lenovo Smart Display can also cast selected apps to a Chromecast device plugged into a TV or directly to a TV with Chromecast built-in. Selected music apps can be cast to a Chromecast for Audio device, or compatible home theater receivers and sound bars. Make Video Phone Calls: Google Duo allows you to make video calls to others that have the Google Duo app. However, you can make voice-only calls to anyone just as with a Google Home. Tell the Smart Display to call one of your contacts or dial a number and you will be connected. When not making video calls, the camera has a slide cover for added privacy. You can mute the microphones, but that will disable reception of voice commands. Control Your Home: The Lenovo Smart Display can control over 5,000 smart home products from brands such as Nest, Philips Hue, TP-Link, Wemo, Ring, and more via Google Assistant. This includes Lights, security camera and video doorbells, baby monitors, thermostats, locks, smart plugs, and a lot more. Get Information: The Smart Display can answer almost any question. Answers may be provided in an audio form, audio with an image, or audio with video depending on the resource. Weather information is provided both audibly via the speaker and visually via the screen. When asking for directions, traffic, or location information the Smart Display will also show the necessary map(s). You can ask the Smart Display to tell or show you the latest news headlines from CNN, CNBC, Reuters TV, or other select sources. If you say "OK Google, Good Morning", the Smart Display will acknowledge your name and provide weather, time, news, and other information, such as daily reminders and shopping lists. You can also create shopping lists and also use your voice to shop Walmart, Costco, Walgreens, PetSmart and more using Google Express. The Smart Display can show not only where to buy something, but what the product looks like. The Lenovo Smart Display also can serve as a cooking assistant. It can show you cooking videos from YouTube and Food Network, as well as step-by-step recipes from the Food Network, Delish, King Arthur Flour, and Betty Crocker. When using recipes, the Smart Display will display images of each ingredient, followed by each preparation step. You can advance to (or repeat) each step using your voice or tapping onscreen prompts. You can also use voice commands to set one, or more, timers on the smart display to aid in the food preparation and cooking process. The Lenovo Smart Display is not waterproof. Use caution in kitchen near sinks and bowls containing liquids. The screen on the 8-inch model has an approximate 720p resolution (1200 x 800 pixels), while the 10-inch model is approximately 1080p (1920 x 1200 pixels). In addition to voice and touchscreen, onboard controls are provided for speaker volume and microphone muting. Four microphones are provided for voice commands and audio/video phone calls. They respond to voice commands even if there is music playing and are always on unless muted. A 5-megapixel camera is provided for video calling. Video call resolution is 720p. The camera can't be used to take selfies. For audio, a 10-watt amplifier is combined with one speaker and two passive radiators mounted on the front left side of the cabinet. Built-in Dual Band WiFi is provided for home network and internet connection. There is no Ethernet connection option. The Lenovo Smart Display extends the capabilities of the smart speaker concept into the visual realm, which provides users with similar interactivity you would find the Google Home Hub or the Amazon Echo Show, with some added tweaks and even some design flair. The 8-inch model is grey and measures (horizontal placement), 5.6 inches (H), 10.36 inches (W), with a depth variation of .5 to 4.38-inches. The 10-inch model comes with a bamboo finish on the back and measures (horizontal placement), 6.85 inches (H), 10.36 inches (W), with a depth variation .5 to 5.36-inches. Amazon Echo Show or Lenovo Smart Display — Which Is Best? Smart Home Hubs: Which Home Automation System Is Right For You? Amazon Echo Is in Millions of Homes but What Is It Doing There?